As a Coastline customer you have responsibilities towards your property that are part of your tenancy agreement. 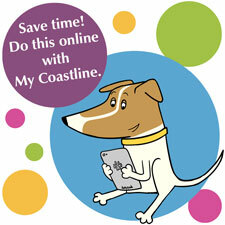 Our Handyline and Coastline Plus services can help. All these jobs and many more can be completed through Handyline. You will be asked for payment in advance and work will be completed within 30 days. This is not a service for urgent work. Please note the removal of garden waste is not included under Handyline. If you supply the waste bags the operatives will fill them for you, if time permits. To encourage you to keep your garden tidy and maintained, Coastline offers you the opportunity to have regular grass cuts over a 12 month period. These can be on a two or four week cycle. We aim to offer these services throughout our communities for Coastline customers. Please note the removal of garden waste is not included under Handyline. This service takes care of your bigger jobs around the home and garden, like painting and decorating, or clearing an overgrown garden. We will arrange a visit, cost the job and offer you a competitive quote based on the amount of work required. As with any service you are arranging, we recommend you get other quotes so you can see how we compare for value. Coastline Plus is an extension of the good quality maintenance service already carried out by Coastline Housing and Coastline Services. All work is completed by a skilled, reliable and trustworthy workforce.